I'm still a newbie in this whole ROM-patching thing and I'd like to know which emulators run better and smoother patched/hacked/etc ROMs per system. In my case, I'm looking for DS, SNES and GBA emulators, but I guess information about any system will be helpful to other newcomers too. Ideally ROM hacks would be written to work within the limits of the original hardware and would work on any emulator or real hardware. But in reality many hacks might be depending on BAD emulation (unintentionally usually) to run right. Higan is extremely accurate, but requires a very beefy system to run. Keep that in mind if you don't want your system to go up in flames. Otherwise, try a Linux distro called "Lakka". You can boot it off of a USB drive and it emulates games very well. The system requirements aren't too demanding, and it can run fine on your stock Intel HD Graphics GPU, no Nvidia nor ATI required! I guess it depends on your definition of beefy. I have a i5 8600k and a GTX 960 but higan seems to use only about 20% of CPU and 10% of GPU based on task manager. I used to run higan with a i5 2500k which was released in 2011, over 7 years ago now. But I guess not everyone has the luxury to have medium to higher end computer parts, so that's understandable. True dat, but don't expect a laptop sold at Office Depot, Staples, or even your workplace office computer to run it at all. I wouldn't risk running it on any of those things even if it was Higan under Lakka. Well, I guess if it's cold and the heater is out, I can run Higan on a stock office laptop and enjoy the warmth coming from the motherboard burning and fizzing out. Point is that it doesn't matter. It might. My five year old HP desktop PC seems to be able to run higan okay. (I can't remember if I upgraded anything inside it or if it's still the same hardware it came with) So I would imagine a current cheap PC to be able to handle it. I've always thought that hardware offerings would catch up to BSNES/Higan, not the other way around. The big thing was about dual core, and some "walmart specials" may or may not be able to catch up to that kind of power now. If nothing else, BSNES Mercury might work out. I use SNES9X for snes, mGBA for GBA, mednafen for ps1, bgb for gameboy, dolphin for gc/wii, m64p for N64, and PCSX2 for PS2. I try to keep it fairly organized in my emulation folders at least. Oof! I meant using Higan to run Super FX games accurately. The HP Thin Client which I used at my (former) job would surely set off a smoke detector if I tried playing Star Fox on it. But if it isn't Super FX, ZSNES should be good enough. Please don't suggest ZSNES, it hasn't been updated in a looooooooooooooooooooooooooooooooooooooooooooooooong time. At least suggest SNES9X. That's a good list, but remember you can just use Retroarch and use all of those emulators within one program. BSNES/Higan is best if you care about accuracy, SNES9X is acceptable for casual playing. Don't forget Bizhawk, which also includes many cores for different emulators but is designed for re-recording to make tool-assisted speedruns. Since the guys at TASmovies want the accuracy to be such that the recordings can be played back perfectly on actual hardware, it's a good sign that Bizhawk's cores are accurate. Oh, and if you buy a cheap Chinese Android TV box then you can run Retroarch with many of the emulators at full speed. Oh, and don't touch ZSNES with a ten-foot pole. I stopped at the poor sound quality, but I'm sure there's a number of other reasons. I literally have not used it for any purpose other than savestate hacking in about that many years. Did it take 12 years to get us to stop people saying "Nesticle is good enough"? Well, there was never a version of Nesticle for Windows, and even from a DOS prompt in Win9x I can remember having problems with it. That put a prety big dent in its userbase. 98% of the time there's nothing in ZSNES that will make you exclaim, "Ugh, this is so inaccurate that it's completely unplayable." That's a good list, but remember you can just use Retroarch and use all of those emulators within one program. RetroArch doesn't emulate the PS2 at this time. Same here, it's not like using ZSNES will give you AIDS or anything. I use ZSNES because many palette editing programs make use of the ".zst" savestate format, as well as Tile Molester. 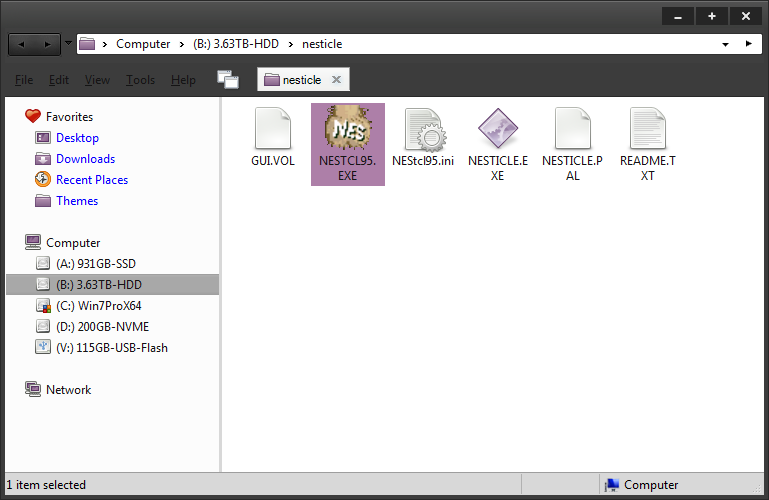 Nesticle is nice because you can edit tiles in real time. Can't find that tile in the ROM? Just load up the ROM in Nesticle, get to the a point where that tile shows up, and edit it right then and there. There most certainly was: I used it on my old 486 system running Windows 95A to do modem based netplay with a friend of mine. Retroarch is good if you're looking for slightly easier configuration (sometimes) VS standalone emulators at the expense of stability. I much rather prefer to use emulators made by the authors themselves (who are typically pretty good coders) than the Frankenstein's Monster Retroarch is. I've given it serious attempts to drive emulator based PCs and Android devices I've built over the years with it and I would typically give up after randomly having various cores crash or losing and/or corrupting save data. Then again, that's just my opinion: Some people seem to love it? I stand corrected. Why did I not try using that back in the day..? I've poked at Retroarch and I didn't really get it either. Seems to be from the same school of thought that spawned XBMC.